Open Source, a ground-breaking, outdoor citywide exhibition, features over 40 public events in the month of October and beyond as part of the City of Philadelphia Mural Arts Program. Pictured: Seven Moon Junction © 2014, The Greenway Wall at Dewey Square Park, Boston, MA , courtesy of James Cohan Gallery, New York and Shanghai, by Shinique Smith. Smith is one of the 14 artists participating in Open Source. Robin Bloom offers twenty suggestions for what to do this week. Opera Philadelphia presents the American premiere of Verdi’s tragic love story La traviata, with five performances October 2-11 at the Academy of Music. 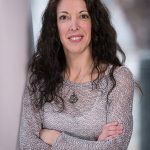 Corrado Rovaris directs the timeless and lyrical score, a new production by award-winning Scottish director Paul Curran. Starring Metropolitan Opera favorite Lisette Oropesa as Violetta, Grammy Award-winner Alek Shrader as Alfredo, and West Chester baritone Stephen Powell as Alfredo’s father. 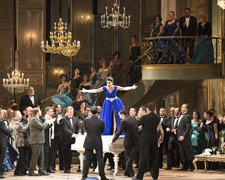 A production from the National Opera House of Bucharest, the show is performed in Italian with English supertitles and libretto by Francesco Maria Piave. Opera Philadelphia offers a free broadcast at Independence National Historical Park Saturday, October 3, 7pm*. The show will be shown in high definition on a giant outdoor screen on Independence Mall. Pre-show at 6pm. Tickets are free but registration is required. Part of Ciao Philadelphia, a month-long celebration of Italian and Italian-American heritage in Philadelphia. * UPDATE – Due to rainy weekend forecasts, Opera Philadelphia announced that its FREE HD broadcast of Verdi’s La traviata has been rescheduled to Friday, October 16. All tickets issued for the original broadcast date of Saturday, October 3, will be honored on the new date, and guests can continue to register for free tickets until Friday, October 16. The City of Philadelphia Mural Arts Program began as an anti-graffiti program and has expanded in over 30 years to an international leader in community based public art, earning the city the recognition as the “City of Murals.” October is Mural Arts Month and this year, the nation’s largest public art program celebrates in a bold way with Open Source, a ground-breaking, outdoor citywide exhibition featuring over 40 public events in the month of October and beyond. 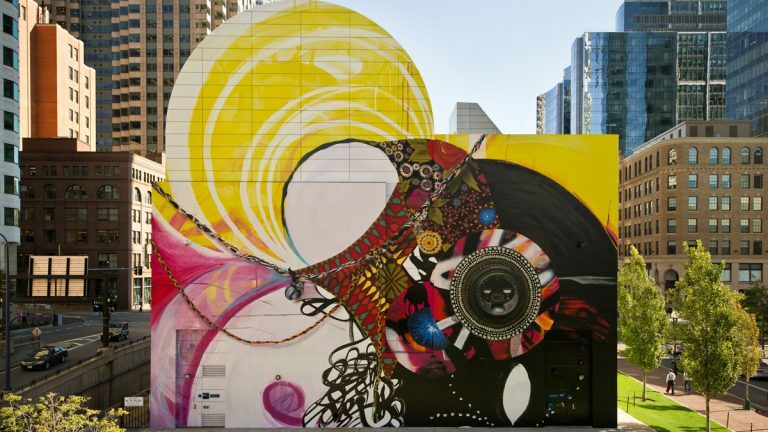 The biggest display of site-specific art offers large-scale, public artwork created by 14 leading contemporary artists, community-based public artists, and street artists in a variety of media from walk-through installations and skateable sculptures, to vinyl portraits and stenciled imagery, to immense murals. Artists hail from Philadelphia and across the United States and Europe. Highlights include one full tour of all Open Source projects on October 11, walking and trolley tours including some with Executive Director Jane Golden or Open Source Curator Pedro Alonzo on various dates, an opening party at Bok on October 2, North Philly Block Party on October 3, and much more. The Open Source Hub in the Graham Building, 30 S. 15th Street, Philadelphia, serves as a gathering space for exhibits and events including panel discussions, lectures, art-making, and workshops for all ages. Many events free to the public. 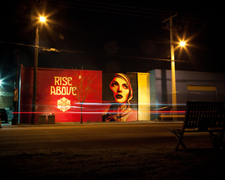 Pictured: Rise Above Rebel © 2012, Shepard Fairey. Dallas, TX. Photo by Jon Furlong. Courtesy of Shepard Fairey. 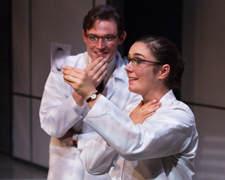 Lantern Theater Company opens its new season with Anna Ziegler’s Photograph 51, the story of Rosalind Franklin, a young British scientist specializing in x-ray crystallography, who produced Photograph 51 while working at King’s College in London in the 1950s. That image became the key factor in James Watson and Francis Crick’s discovery of the double-helix structure of DNA, for which the two men were awarded the Nobel Prize in Physiology or Medicine. Directed by Kathryn MacMillan and starring Philadelphia favorite Geneviève Perrier, with Trevor William Fayle as Watson and Harry Smith as Crick, and Joseph McGrahaghan, Harry Watermeier, and Chris Anthony making their Lantern debuts through October 18. Related programs and events include In Conversation: Storytelling and the Jewish Diaspora, Monday, October 5, 7pm, using the stories of the characters in Photograph 51 and (the next Lantern production) Underneath the Lintel as a basis to explore how Jewish characters face the challenges of planting roots, moderated by WHYY’s Dave Heller and featuring panelists Josh Perelman of the National Museum of American Jewish History, playwright Glen Berger, and Kathryn MacMillan, St. Stephen’s Theater, 10th and Ludlow Streets, Philadelphia. Photo by Mark Garvin. The last Night Market of 2015 is at Frankford & Girard, Thursday, October 1, 6pm-10pm, featuring the best ethnic and regional restaurants and food trucks. The roving street festival puts a spotlight this time on Fishtown’s unique, diverse, vibrant and up and coming neighborhood and celebrates the city’s diverse food scene with vendors and entertainers. Photo by Dave Tavani for The Food Trust. 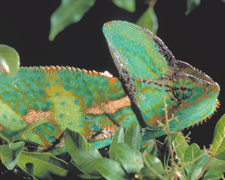 Reptiles: The Beautiful and the Deadly opens at the Academy of Natural Sciences of Drexel University, featuring 20 species of live reptiles on view including a bearded dragon, Gila monster, deadly snakes, colorful lizards, turtles, rugged crocodiles from around the world through January 10. Opening weekend activities include crafts and reptile shows like Rad Reptile Relatives: Dandy Dinos and Bodacious Birds, Reptile Dinner Party, Fur Feathers, and Scales, and more, October 3-4, 1900 Benjamin Franklin Parkway, Philadelphia. Photo by Joe McDonald. 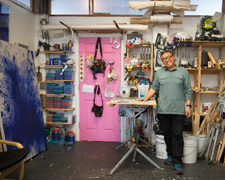 The annual Philadelphia Open Studio Tours returns for the 16th year, October 3-4 for studios East of Broad Street and October 17-18 for studios West of Broad Street, as hundreds of professional visual artists in several dozen Philadelphia neighborhoods open their studios to the public for the display and sale of their artwork, guided tours, workshops, artist talks and more, noon-6pm each day. Free. A list of participating artists, neighborhood maps, and free mobile app and smartphone guide available online to plan your own itinerary. Guided trolley tours available October 4 & 18, 1pm. Presented by the Center for Emerging Visual Artists (CFEVA). Pictured: Myung Gyun You’s studio in Kensington (photo by Caitlin Beattie). In the pre-dawn hours of October 4, 1777, General George Washington made a daring, but failed attempt to retake Philadelphia from the British by attacking their encampments, culminating in the battle of Germantown. 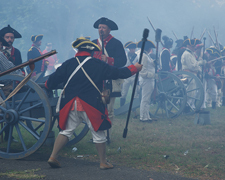 The Revolutionary Germantown Festival commemorates the encounter this Saturday, October 3, a day of historic entertainment beginning at 10am with live presentations, guest re-enactors, merchants offering colonial replica crafts and souvenirs, beer garden, children’s activities, and more at historic sites in Philadelphia’s Germantown section, including the reenactment of the Battle of Germantown at Cliveden at noon and 3pm. The day closes with a traditional Oktoberfest at Grumblethorpe, a 1774 colonial German country seat, Germantown. Free. Photo courtesy of Historic Germantown. 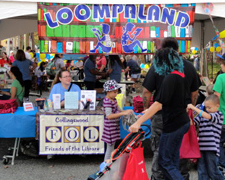 Don’t miss the 13th Annual Collingswood Book Festival, Saturday, October 3, 10am-4pm, as Haddon Avenue is filled with nationally recognized authors for adults and children including hometown favorite Matthew Quick, George Anastasia, James Hannaham, Ann Atkins, Elise Juska, Tom Coyne, and many more as well as booksellers, storytellers, poetry readings, workshops, exhibitors, kid-friendly activities in Loompaland, and entertainment for all ages, Collingswood, New Jersey. All events are free. Rain or shine. In the event of rain, the festival moves inside to Collingswood High School, 424 Collings Avenue. 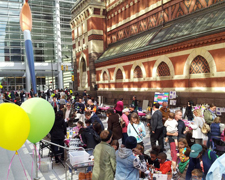 The Pennsylvania Academy of the Fine Arts hosts a free Family Arts Festival, Sunday, October 4, 12pm-4pm, offering admission to the museum, live performances, art-making stations, games and other family activities, taking place rain or shine on Lenfest Plaza, 128 North Broad Street, Philadelphia. The festival kicks off a season of free Family Arts Academy workshops, held every Sunday at PAFA. Photo courtesy of PAFA. 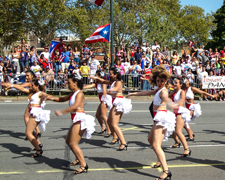 The annual Puerto Rican Day Parade, Philadelphia’s largest outdoor celebration of Puerto Rican and Latino heritage is Sunday, October 4, beginning at 10am in a new location: the parade will begin in downtown Philadelphia at 16th and the Benjamin Franklin Parkway and will Grand Stand at Logan’s Square. After the parade, a festival takes place at American Street and Lehigh Avenue. Organized by the Council of Spanish Speaking Organizations of Philadelphia (Concilio). Photo courtesy of Concilio. Experience the beautiful autumn color at Morris Arboretum with their annual Fall Festival, Saturday and Sunday, October 3-4, 10am-3pm both days. Make a scarecrow, sample apples, paint a pumpkin, visit with animals from Elmwood Park Zoo, build a version of Robert Indiana’s LOVE statue out of LEGOs, and more, 100 East Northwestern Avenue, Chestnut Hill. Photo courtesy of Morris Arboretum. This event is rain or shine. 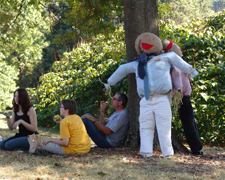 Scarecrow Walk will now start Oct 6.Midtown Village’s 10th annual Fall Festival is Saturday, October 3, noon-8pm. 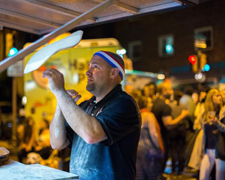 The block party includes food, a beer garden, arts and crafts, shopping at the area’s boutiques, children’s activities and more, Chestnut Street between Broad Street and 12th, Philadelphia. Free. Rain or shine.Germantown Avenue is transformed into an outdoor arts marketplace this Sunday, October 4, for the Chestnut Hill Fall for the Arts Festival. More than 150 artists and crafters from across the country will display their work between Willow Grove and Rex Avenues in addition to live music on two stages, food, and children’s rides, activities, and the new “Makers Village,” 11am-5pm, Germantown Avenue, Chestnut Hill. Free.Bloktoberfest returns this Saturday, October 3, noon-9pm, offering a wide selection of beer by craft breweries from around the country, food from neighborhood vendors and food trucks, and multiple stages of live music on 4 blocks of South Street, between Broad Street and 18th Street, Philadelphia. Free to attend with beer proceeds going to local charities and programs. Rain or shine.The 3rd annual Roxtoberfest, a Roxborough street festival, is Saturday, October 3, noon-6pm. Enjoy live music on the Showcase Stage by Tom Gillam and Friends, Adam Monaco, Ladybird, Richard Bush and the Peace Creeps, Cliff Hillis, and more, along with food, crafts, beer tasting, children’s activities and more, Ridge Avenue between Green Lane and Leverington Avenue. Rain date Sunday, October 4. 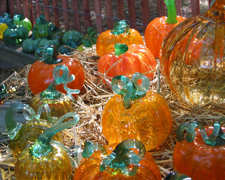 Wheaton Arts’ Festival of Fine Craft is this Saturday and Sunday, October 3-4, 10am−5pm both days, with over 130 juried artists, children’s activities, demonstrations, musical entertainment, food, the annual glass pumpkin patch (pictured), and a beer and wine garden, 1501 Glasstown Road, Millville, NJ. Rain or shine.Get a glimpse of Mennonite life a century ago at the annual Apple Butter Frolic, Saturday October 3, 9:30am-4pm, with authentic Pennsylvanian German food, crafts and folk crafts demonstrations, silent auction, horse and wagon rides, sheep herding, and more at the Mennonite Heritage Center, 565 Yoder Road, Harleysville, PA. Rain or shine. * UPDATE – Due to prediction of inclement weather on Saturday, all farming/craft demonstrations and programs have been cancelled. Homemade food will be available for take out beginning at 9:30am.The Riverfront Ramble is Saturday, October 3 beginning at noon, with live music including Yolanda Adams, Freddie Jackson, food, crafts, music, boats, contests, fireworks and more, along the Chester Waterfront, Chester, PA.The Appel Farm Music & Wine Festival takes place Saturday, October 3, noon-6pm, with music by the female blues and roots vocal trio from Philadelphia No Good Sister, South Jersey’s own swing cabaret band Swing that Cat, singer/songwriter Nancy Micciulla, roots/rock/reggae band Steppin’ Razor, and more, including crafts, food, and 15 wineries represented from around the region. Stay overnight and enjoy the festivities, Elmer, NJ. * UPDATE – due to the weather, the festival has been rescheduled for Saturday, June 4, 2016.7th Street Arts Bridge Kick-Off will be held Friday, October 2, 5:30pm-8pm, celebrating the conceptual “bridge” that connects artists, entrepreneurs and residents to downtown Wilmington. Part of the first Friday Art on the Town loop, enjoy music by Jea Street and JaE, hip hop performance by Street Xpressions, food trucks, art projects and more at the new Inspire Lot, 215-219 W. 7th Street between Orange and Tatnall Streets. Free admission. * UPDATE – this event has been canceled and will be rescheduled in the spring.